Apple is said to have three new iPhone models in the pipeline for a late 2018 launch, two of which will be the company's biggest handsets ever, crossing the six-inch threshold with new edge-to-edge OLED and traditional LCD models. Analyst Ming-Chi Kuo of KGI Securities issued a note to investors on Monday, a copy of which was obtained by AppleInsider, revealing that Apple has a 6.5-inch OLED iPhone on tap for launch in the second half of 2018. This handset would presumably serve as a sort of "iPhone X Plus," taking the general size of a Plus-sized iPhone and adding an edge-to-edge OLED display. But Apple is also working on a new LCD model with a large 6.1-inch display, according to Kuo. He believes that this model will be targeted toward the low-end and mid-range smartphone markets. This new model will "differ significantly" from the OLED models, boasting a lower-resolution display to achieve a price point between $650 and $750. But it's likely that this model will feature Face ID and advanced cameras to replace Touch ID, according to Kuo. He also believes that Apple will greatly reduce the bezels on this LCD model, thanks to the elimination of Touch ID. These two handsets will be flanked by a next-generation iPhone X, he said, featuring the same 5.8-inch edge-to-edge OLED display as the recently released model. 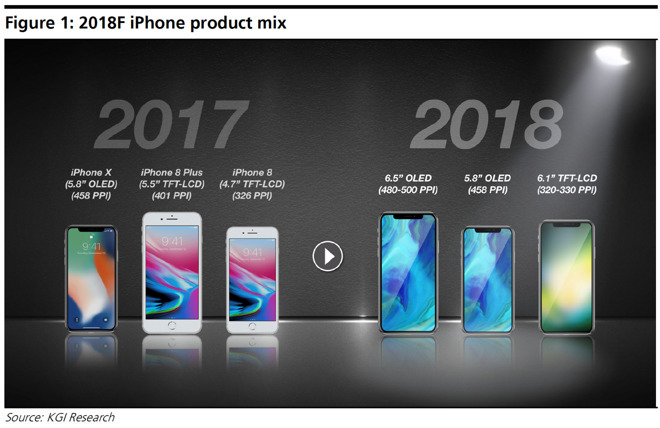 With three new handsets apparently in the works for late 2018, the analyst predicts that Apple will see a "super-cycle" of sales, aided by the fact that the company's supply chain will be better suited to handle manufacturing of the new technologies introduced in the iPhone X. Word of a 6.5-inch iPhone arriving next year first surfaced back in September. Around the same time, Kuo himself reported that all iPhones set to launch in fall of 2018 will ditch Touch ID for Face ID, allowing a swift removal of the physical home button. At present, the iPhone 8 boasts a 4.7-inch screen, the iPhone 8 Plus is 5.5 inches, and the OLED iPhone X has a 5.8-inch screen.